Japan has conducted its first dedicated commercial satellite launch Tuesday, with an H-IIA rocket carrying a Canadian communications spacecraft, Telstar 12V, into orbit. 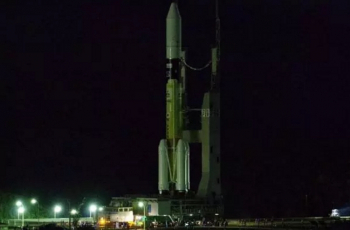 The launch departed Japan’s Tanegashima Space Centre within a 104-minute launch window, with a T-0 of 15:50 local time (06:50 UTC) following a delay caused by a boat entering the range. Despite having made one hundred orbital launch attempts to date – the first of which occurred in 1966, with the first success coming in 1970 – Japan has been slow to enter the commercial launch market. Tuesday’s mission was the first to carry a commercial satellite as its primary payload and only the second to carry a large commercial satellite at all – the first being 2012’s deployment of South Korea’s Arirang-3 as a secondary payload to the Shizuku (GCOM-W) climate observatory. During the mid-1990s, Hughes Space and Communications signed a contract with Japan’s National Space Development Agency (NASDA) – then one of two national space agencies of Japan that have since merged to form the Japan Space Exploration Agency (JAXA) – and Rocket Systems Corporation, the Mitsubishi-led alliance of companies responsible for the development of the H-II rockets, that would have seen ten commercial H-IIA launches conducted between 2000 and 2005; however this contract was later cancelled after the poor reliability of the H-II vehicle dented Hughes’ confidence in its successor. The contract for Tuesday’s launch of Telstar 12V for Canada’s Telesat was signed in September 2013 shortly after Telesat placed an order with Airbus Defence and Space to build the satellite. Telstar 12V is based on Airbus’ Eurostar 3000 satellite bus. The Telstar 12V spacecraft, which is also known as Telstar 12 Vantage, is a 4,900-kilogram (10,800 lb) spacecraft intended to replace the sixteen-year-old Telstar 12 satellite in operation at an orbital slot of 15 degrees West. Telstar 12 was originally built as Orion 2 for Orion Network Systems, which was acquired by Loral Skynet a few months before the satellite launched. Telstar 12 lifted off from Kourou, French Guiana, atop an Ariane 4 rocket on 19 October 1999. The satellites in the former Orion fleet were subsequently renamed, with Orion 1 becoming Telstar 11 and Orion 2 becoming Telstar 12. The Orion 3 satellite, which was stranded in a low orbit after the failure of its Delta III carrier rocket, was not renamed even though prime contractor Hughes were in talks with NASA about flying a Shuttle mission to correct its orbit. Loral Skynet merged with Telesat Canada in late 2007 to form Telesat, which is owned by Loral Space and Communications and Canada’s Public Sector Pension Investment Board (PSP). The Telstar name of the satellites originates from AT&T’s satellite fleet, which was acquired by Loral in a 1997 merger that formed Loral Skynet. The original Telstar was an experimental low orbit communications satellite operated by AT&T’s Bell Telephone Laboratories in conjunction with NASA and the British and French national telecommunications companies. When it launched in July 1962, Telstar was the first commercial satellite to be placed into orbit and it was followed by a second spacecraft, Telstar 2. However, geostationary satellites proved more practical and AT&T abandoned plans for an operational Telstar constellation. When AT&T began to build its own fleet of geostationary satellites in the early 1980s, the company chose to revive the name of its first satellites, with three Telstar 3 spacecraft designated Telstar 301, 302 and 303. These were followed by Telstars 401, 402 and 402R – the latter a replacement for the 402 spacecraft which had failed just minutes after launch. When the constellation passed to Loral the numbering changed back to a sequential system, with Telstar 402R – being the only remaining operational satellite – renamed Telstar 4. The new Telstar 12V satellite carries 52 Ku-band transponders to replace the 38 carried by its predecessor and is expected to provide a further fifteen years of service to the same regions. These include Europe, most of South America, the eastern parts of Central America, Canada and the United States, the north coast of Africa, the Middle East and South Africa. Tuesday’s mission was a rare outing for the H-IIA’s 204 configuration, the most powerful version of the rocket to be flown. 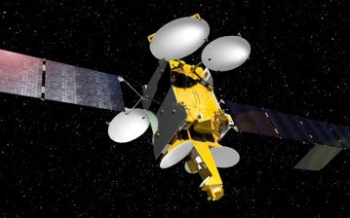 Equipped with four SRB-A3 boosters in place of the two used on the standard 202 configuration, the H-IIA 204 has only flown once before, delivering the Kiku VIII, or Engineering Test Satellite 8 (ETS-8) into geostationary transfer orbit in December 2006. The Telstar launch also marks the debut of upgrades to the rocket’s second stage aimed at increasing the vehicle’s payload capacity and improving its ability to fly geosynchronous missions. Changes to the second stage include a more efficient turbopump cooling system that will require less of the vehicle’s oxidiser supply and modifications to the attitude control system allowing evaporating propellant to be used to provide a small forward thrust during coast phases in order to keep the rockets propellants at the rear of their tanks – a function previously performed by firing reaction control thrusters. The rocket was equipped with a higher capacity battery to power its avionics systems and a more powerful communications antenna. 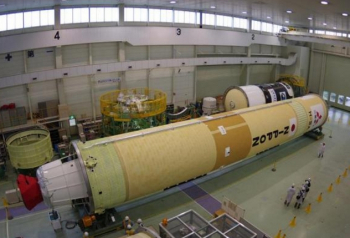 The second stage was also being painted white and a roll manoeuvre introduced to aid cooling during coast phases. 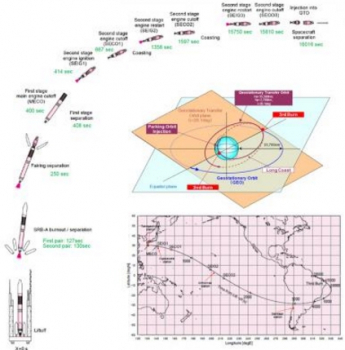 These changes were primarily geared towards enabling the rocket to perform longer missions that require extended periods of coasting, such as direct insertions into geostationary orbit, or missions to transfer orbits with higher perigees. The second stage engine was modified to allow it to be throttled to 60% thrust, allowing the final insertion burn to be performed more accurately. For Tuesday’s launch, the target orbit was a high-perigee Geosynchronous Transfer Orbit, with a perigee of 2,700 kilometres (1,678 miles, 1,458 nautical miles), an apogee of 36,585 kilometres (22,733 miles, 19,754 nautical miles) and 20.1 degrees inclination to the Equator. The rocket that was used, H-IIA F-29, was making the twenty-ninth flight of the H-IIA rocket and the forty-first across all members of the H-II family. The launch began with the ignition of the rocket’s LE-7A first stage engine, followed by the four SRB-A3 strap-on boosters. Booster ignition occurred as the countdown reached zero – a time designated X-0 in Japanese nomenclature but identical to the T-0 seen with Western launches – at which point the rocket began its ascent into space. Performing a series of manoeuvres to place itself onto the proper trajectory for its geosynchronous transfer orbit, H-IIA F-29 flew under the power of its core stage engine and the four solid boosters for approximately 116 seconds, at which point the boosters burnt out, having expended their propellant. The first pair of boosters separated from the core vehicle 127 seconds after launch, with the second pair jettisoned three seconds later. The first stage continued to burn its liquid hydrogen and liquid oxygen propellant, with the next flight event being the separation of the payload fairing from the nose of the vehicle at four minutes and ten seconds elapsed time. The first stage engine cut off six minutes and forty seconds after liftoff, with the spent stage separating eight seconds later and the second stage igniting six seconds after that. For the Telstar launch, the H-IIA’s second stage was called upon to perform three burns of its LE-5B engine. The first of these lasted four minutes and thirteen seconds, establishing an initial parking orbit. Eleven min utes and 29 seconds after this burn is completed, the stage was restart for its second burn, lasting four minutes and one second, to enter geostationary transfer orbit. The third and final burn was performed at apogee, to raise the perigee of the orbit. An extended coast phase occurred between the second and third burns as the vehicle ascended towards its orbit’s apogee. Three hours, 55 minutes and 53 seconds after the end of its second burn, the LE-5B ignited for a one-minute burn to increase the perigee of the orbit. Three minutes and 26 seconds after the end of the final burn, Telstar 12V separated from the H-IIA to complete the four hour, 26 minute and 56 second launch. The launch was conducted by Mitsubishi Heavy Industries. 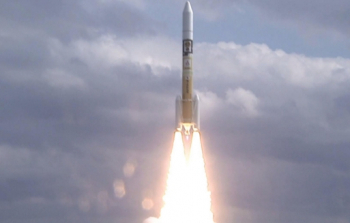 The H-IIA lifted off from Pad 1 of the Yoshinobu Launch Complex at Japan’s Tanegashima Space Centre. Built in the 1990s for the H-II rocket, Pad 1 is the oldest of two that comprise the Yoshinobu complex – the second was built in the early 2000s to allow additional H-IIA launches. However, it was not used until 2009 when the H-IIB rocket made its maiden flight. 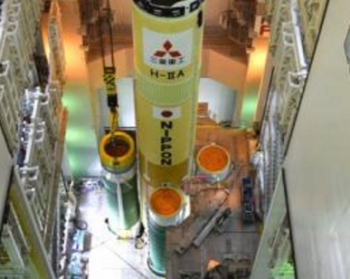 Since then all H-IIA launches have used Pad 1, with all H-IIB rockets flying from Pad 2. Rockets are prepared for launch in an off-pad assembly building and transported vertically to the launch pad atop a mobile launch platform. A clean pad approach is used with both launch pads; all umbilical connections are made to two towers on the launch platform that are transported with the rocket, with lightning towers the only large permanent structures at the pad. For some years an old fixed service tower stood unused at Pad 1, left over from the earlier H-II, however this has now been demolished. Tuesday’s launch was the seventy-first orbital launch of 2015 – including three failed launches that did not achieve orbit and February’s Vega launch which was not catalogued as orbital despite achieving orbit during a series of tests at the end of a successful suborbital primary mission. It was the fourth and final launch of the year for Japan, with H-IIA launches in February and March having carried Information Gathering Satellite (IGS) reconnaissance spacecraft into orbit and an H-IIB launch in August deploying the Kounotori 5 (HTV-5) resupply mission to the International Space Station. 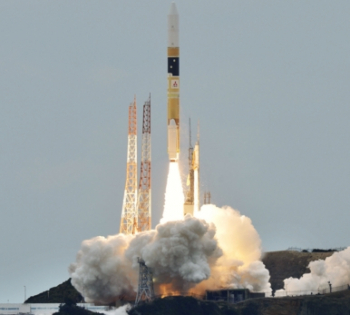 Japan’s next orbital launch is expected to be of an H-IIA early next year, carrying the ASTRO-H x-ray observatory. Telesat does not have any further launches scheduled at present, however the company recently announced that it was planning to acquire a new satellite, to be named Telstar 19V, with an order expected to be placed in the next few weeks. (Images via JAXA and Astrium).